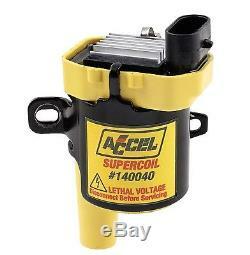 Ignition Coil-Super Coil ACCEL 140040ACC. Specialized high temperature epoxy resists shock and vibration, while increasing thermal conductivity. These are direct plug replacements for OEM coils. They feature bodies and, or secondary towers molded in ACCEL yellow and feature brass secondary contacts (except direct fire coil on plug applications). Product Description - Extended 240 : Super Coil; Direct Plug-In Replacement; Round Coil w/Horizontal Bracket; Verify Mounting Bracket; Yellow. Associated Comments - 2000 : Standard Motor Products SMP Uf-262. Product Description - Long - 80 : LS1 TRUCK SUPER COIL. Product Description - Short - 20 : Ignition/Electrical. See Item Specifics section for additional specifications about this part. To confirm that this part fits your vehicle, enter your vehicle's Year, Make, Model, Trim and Engine in the Compatibility Table. Also review the notes section in the compatibility chart for additional specifications about this part. The engine types may include 4.8L 294Cu. V8 GAS OHV Naturally Aspirated, 5.3L 5328CC 325Cu. V8 ELECTRIC/GAS OHV Naturally Aspirated, 5.3L 5328CC 325Cu. V8 FLEX OHV Naturally Aspirated, 5.3L 5328CC 325Cu. V8 GAS OHV Naturally Aspirated, 6.0L 5967CC 364Cu. V8 BI-FUEL OHV Naturally Aspirated, 6.0L 5967CC 364Cu. V8 CNG OHV Naturally Aspirated, 6.0L 5967CC 364Cu. V8 GAS OHV Naturally Aspirated. This part fits vehicles made in the following years 1999, 2000, 2001, 2002, 2003, 2004, 2005, 2006, 2007. This item may have been superseded from a different part number from this manufacture. Brand: ACCEL Part Numbers: 140040. Electrical parts are non returnable. We are not responsible for any expenses caused by defective parts from or during installation. The item "Ignition Coil-Super Coil ACCEL 140040ACC" is in sale since Thursday, May 25, 2017. This item is in the category "Automotive\Parts & Accessories\Car & Truck Parts\Ignition Systems\Coils, Modules & Pick-Ups".